In 2017, we published a four part blog series on how to build a genomics workflow on AWS. In part 1, we introduced a general architecture highlighting three common layers: job, batch and workflow. In part 2, we described building the job layer with Docker and Amazon Elastic Container Registry (Amazon ECR). In part 3, we tackled the batch layer and built a batch engine using AWS Batch. In part 4, we built out the workflow layer using AWS Step Functions and AWS Lambda. Since then, we’ve worked with many AWS customers and APN partners to implement this solution in genomics as well as in other workloads-of-interest. Today, we wanted to highlight a new feature in Step Functions that simplifies how customers and partners can build high-throughput genomics workflows on AWS. Step Functions now supports native integration with AWS Batch, which simplifies how you can create an AWS Batch state that submits an asynchronous job and waits for that job to finish. Before, you needed to build a state machine building block that submitted a job to AWS Batch, and then polled and checked its execution. Now, you can just submit the job to AWS Batch using the new AWS Batch task type. Step Functions waits to proceed until the job is completed. 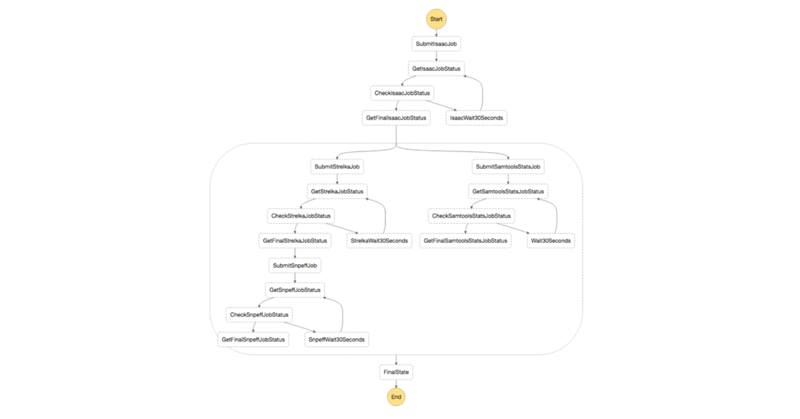 This reduces the complexity of your state machine and makes it easier to build a genomics workflow with asynchronous AWS Batch steps. You can also pass parameters to the service API. To use the new integrations, the role that you assume when running a state machine needs to have the appropriate permissions. For more information, see the AWS Step Functions Developer Guide. In our 2017 post series, we created a job poller “pattern” with two separate Lambda functions. When the job finishes, the state machine proceeds to the next step and operates according to the necessary business logic. 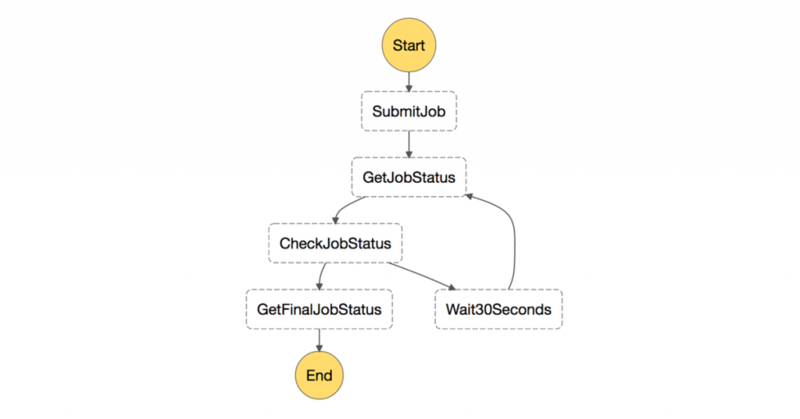 This is a useful pattern to manage asynchronous jobs when a direct integration is unavailable. A job is submitted through a Lambda function. 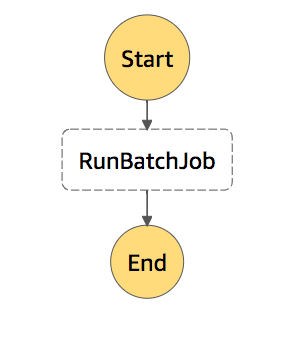 The state machine queries the AWS Batch API for the job status in another Lambda function. The job status is checked to see if the job has completed. If the job status equals SUCCESS, the final job status is logged. 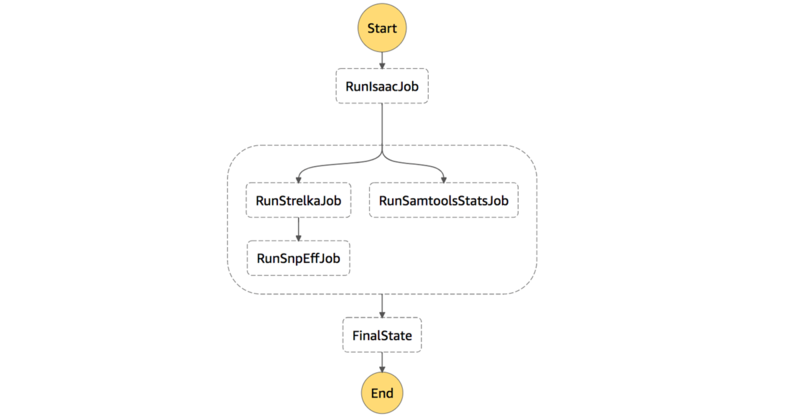 If the job status equals FAILED, the execution of the state machine ends. In all other cases, wait 30 seconds and go back to Step 2. Both of the Submit Job and Get Job Lambda functions are available as example Lambda functions in the console. The job status poller is available in the Step Functions console as a sample project. Here is the JSON representing this state machine. With Step Functions service integrations, it is now simpler to submit and wait for an AWS Batch job, or any other supported service. The following code block is the JSON representing the new state machine for an asynchronous batch job. If you are familiar with the AWS Batch SubmitJob API action, you may notice that the parameters are consistent with what you would see in that API call. You can also use the optional AWS Batch parameters in addition to JobDefinition, JobName, and JobQueue. Here is an example of the workflow input JSON. Pass all of the container parameters that were being constructed in the submit job Lambda function. When you deploy the job definition, add the command attribute that was previously being constructed in the Lambda function launching the AWS Batch job. Overall, connectors dramatically simplify your genomics workflow. The following workflow is a simple genomics secondary analysis pipeline, which we highlighted in our original post series. Description: "Stack that deploys roles for genomic workflow"
Description: "Stack that deploys vps for genomic workflow"
Description: "Bucket that holds workflow job results"
CommandArgs: " -t hg38 "
AWS Step Functions service integrations are a great way to simplify creating complex workflows with asynchronous steps. While we highlighted the use case with AWS Batch today, there are many other ways that healthcare and life sciences customers can use this new feature, such as with message processing. For more information about how AWS can enable your genomics workloads, be sure to check out the AWS Genomics page. We’ve updated the open-source project to take advantage of the new AWS Batch integration in Step Functions. You can find the changes aws-batch-genomics/tree/v2.0.0 folder.